When the cold weather comes it is time for an indoor project that we can complete quickly. Some people like to make a snowman or winter scene, others dream of a warm tropical vacation. No matter where you dream of being, here are some QUICK PROJECTS to fill the cold afternoon or evening when you want something new to do, but don’t want it to take all winter. First, here are some tips to finding quick and easy quilt project patterns. Squares and rectangles are faster and easier to piece than triangles, and way easier than curves. Choose patterns with large applique pieces that can be fused and machine stitched. Those will go much faster than traditional applique. 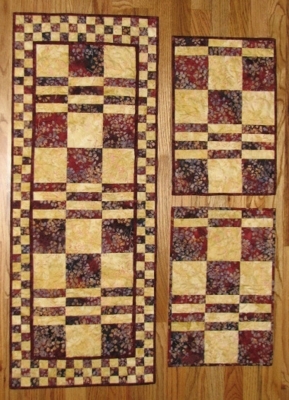 Look for small projects such as table runners, placemat, wall quilts, or lap quilts. They will take much less time than a bed size quilt. Choose a project that has large pieces and less cutting, so you can get right to the fun sewing part. Use your stash – jelly rolls, charm packs, fat quarter bundles, scraps and yardage you already have. This saves shopping time and gives you a great sense of satisfaction. Want a new project? I have gathered a few ideas you might like to try. Here is a quick pillow project you could complete in a day or two. These would look great in any decor and could give you a leg up on Holiday gifts for next year. 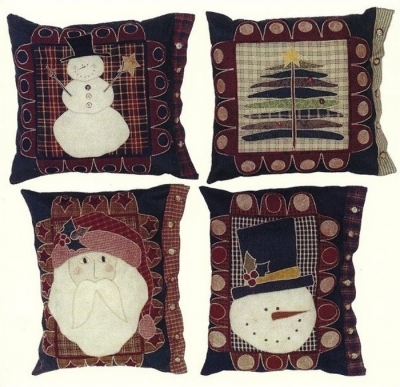 Celebrate the season with this appliqued pillow cover pattern. Quick and easy to complete with fusible applique. You will want to make all 4. Makes a great gift giving idea. Designed by: LCQ – Little Quilt Company – Gary/Kim. Want to use up some of your scraps or stash fabric. How cute is this quick quilt project? This quick little pattern alternates 3 different triangle blocks with a simple fabric square. Small size pattern; one page front & back instructions. Fabrics are from the Flying Geese Collection by Evonne Cook with P & B Textiles/Washington Street Studio. 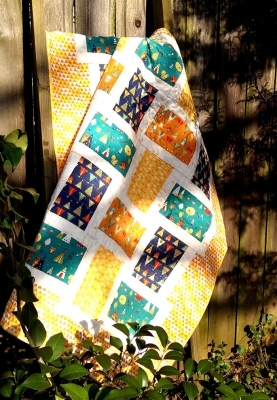 Designed by: CQ2 – Clothesline Quilts – Evonne Cook. Here is a project which could use one of those fabulous fat quarter bundles you have been saving for a cold winter day. Guess what? That day is here! Unwrap that baby and cut it up! Quick and easy baby quilt pattern. Designed by: BHQ – Bear Hug Quiltworks – Lisa Alley. I bet you have some beautiful fabric you fell in love with and just can’t bring yourself to cut it up. Here is a project that lets the fabric do all the talking, and is oh so quick to make. Now that fabric can be on you wall, table or sofa, instead of hidden in your stash. Designed by: LR – Lacey Hill & Ro Gregg. Table runners make great quick projects. And they look fabulous in any setting. 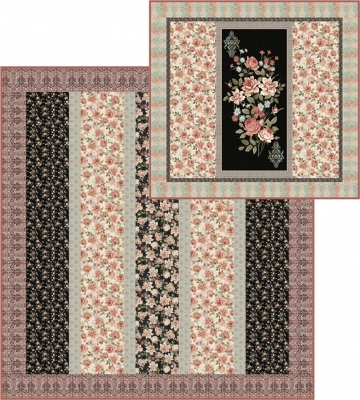 Here is a pair -runner and placemats – that are beginner friendly and very modern. 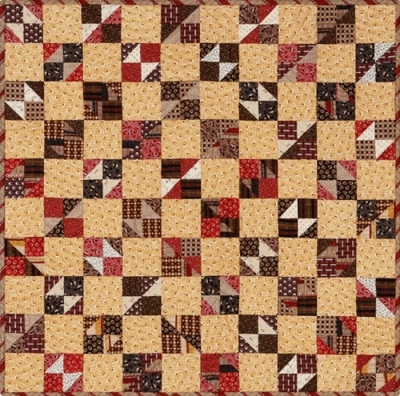 The Running Blocks quilt pattern includes both a simple and easy to piece table runner, and four placements. This attractive, primarily two-fabric design has a small accent border. These quilts make a fun and quick gift for a house warming or any occasion. This is a great beginner project. Quilt pattern includes easy to follow instructions and helpful diagrams. Designed by: FD – Friendship Designs. This entry was posted in Fun!, Helpful Tips, patterns. Bookmark the permalink. Love the cottage rose pattern. I have a stash of beautiful prints that I keep adding to but don’t want to spoil so…. think this will be just the thing to get me started.